Today I want to discuss reputation, security, ethics, why they are important and how they can be related to security. We know that security is important. We also know that there is no such thing as absolute security. But can we do it better? Of course. We can and should do our best to secure our applications, infrastructure, code, policies, etc - but in the end, security is just another technical requirement. A very important requirement that supports the reputation and the perception of a company. Reputation is a very important asset companies (and people) should pursue and work hard to keep because once lost, it's hard to gain it back. For example, a recent survey made by The Identity Theft Resource Center (ITRC) found out that 41 percent of surveyed people said they wouldn't do business with the breached company again. So, let's review LastPass and Log Me In then talk about Equifax's hack to understand how all of that is related. Companies like LastPass live and die by reputation and incidents like their breach in July that exposed master password hashes are hugely significant due to the impact it has on the perception of the company. Equifax collects information on over 800 million individual consumers and more than 88 million businesses worldwide. Equifax has US$ 3.1 billion in annual revenue and 9,000 employees in 14 countries. Not a small company, right? But what about the hack? 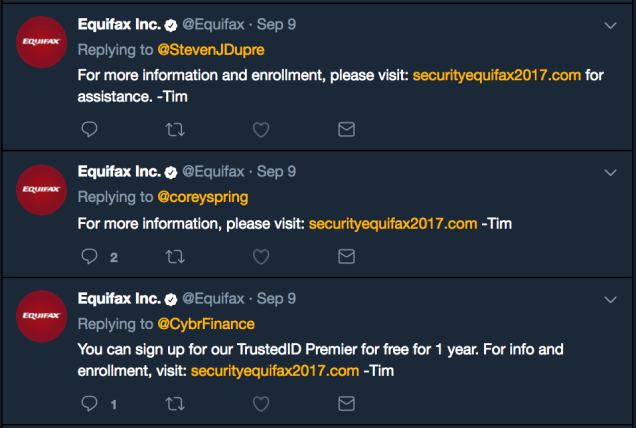 In September 2017, Equifax announced a cyber-security breach, which it claims to have occurred between mid-May and July 2017, where cybercriminals accessed approximately 143 million U.S. Equifax consumers' personal data, including their full names, Social Security numbers, birth dates, addresses, and, in some cases, driver license numbers. Equifax also confirmed at least 209,000 consumers' credit card credentials were taken in the attack. The company claims to have discovered the evidence of cybercrime event on July 29, 2017. Residents in the United Kingdom and Canada were also impacted. the Equifax data breach is, "very possibly the work leak of personal info ever." The breach, via a security flaw on the Equifax website, included full names, Social Security numbers, birth dates, addresses, and driver license numbers in some cases. Many of the affected consumers have never even directly done business with the giant consumer credit reporting agency. Yes, an open endpoint leaking data on a website created to alert users that everything is supposed to be OK. It was removed a little after but you get it. The company that already had their reputation and perception damaged (because of insecure systems), was trying to calm everyone creating a website full of naive technical defects. How critical is that? I think we're seeing a sad pattern here. Hope we don't see any other chapters in this history because the leak is already pretty critical. 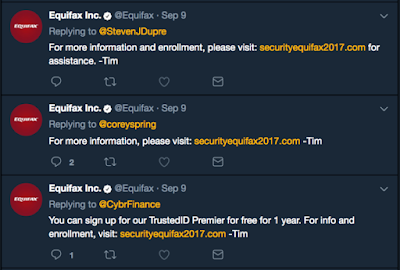 In a tweet to a potential victim, the credit bureau linked to securityequifax2017.com, instead of equifaxsecurity2017.com. It was an easy mistake to make, but the result sent the user to a site with no connection to Equifax itself. Equifax deleted the tweet shortly after this article was published, but it remained live for nearly 24 hours. Pretty sure there's way more out there exploring the situation. The level of incompetence is astonishing! Yes, the interval between the supposed hack and it's public announcement was enough to allow insiders sell 2 million shares. How can a company have its perception improved like that? Probably not going to happen in the near future, especially after more and more bad news about websites misconfigured, data leaks and links to a fake site. So, here's how security, reputation and ethics converge. Perception derives from those and as we saw, is highly influenced by those factors. Security is hard. Ethics in the other hand, can and should be easy - but only if we want to do it. It's about time companies do their best to protect their biggest asset: their customers, their data, their privacy. And it all can start with us, developers. Security and development: how much is being done? For more security posts on this blog, please click here. Update [Mar 13, 2018]: There is a very nice description on why you should consider migrating from LastPass here.